Derek Sexton's Ford Taurus Interceptor and his mugshot from 2007 (inset). Eight years ago, Derek Saxton was driving a black Ford Crown Victoria outfitted with red flashing lights when Chicago Police officers stopped him. Interim Chicago Police Supt. John Escalante launched an investigation last week to determine whether the 35-year-old officer violated state law and department policy by driving the car. The superintendent is considering stripping Saxton of his police powers and placing him on desk duty during the investigation, said Anthony Guglielmi, a spokesman for the police department. The Bureau of Internal Affairs will also review Saxton’s 2012 hiring — including whether he disclosed his 2007 arrest on his job application; what the police investigator conducting Saxton’s background check had discovered; and why Saxton was hired despite his arrest, Guglielmi said. The department will also investigate whether the emergency equipment on Saxton’s Ford Taurus was legal, and why it was on the car. “In Chicago, we have no one permitted to have police equipment in their personal cars,” Guglielmi said. Saxton’s most recent troubles stem from a Skokie police officer spotting his Ford Taurus Interceptor on Jan. 7 outside the AMC Showplace movie theater complex in the north suburb. 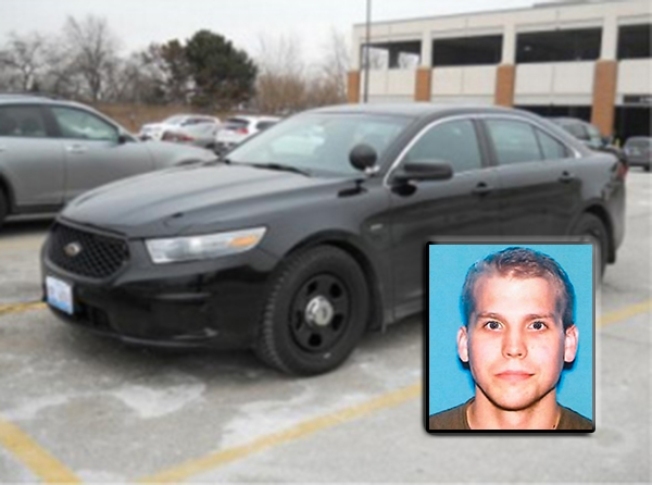 The Skokie officer suspected a “possible police impersonator” owned the Taurus, which was equipped with clear LED lights in the front and rear windshields and on both front quarter panels, according to the Skokie Police Department. The car had a spotlight on the driver’s side of the car and what looked like a siren-and-light switch box on the center console. And the front doors were labeled as having bulletproof panels. The Skokie Police Department put out an alert to local police agencies on Jan. 8, describing the car and giving Saxton’s name as the owner. The alert described his 2007 arrest. It also said Chicago Police ran a license check on Saxton’s car on Dec. 31 and Jan. 2 and the Illinois State Police twice ran checks on the car on Jan. 4. Guglielmi said the Chicago Police investigation will look into why police were running Saxton’s license plate. When Chicago Police officers saw the Jan. 8 Skokie alert, they realized it referred to one of their own officers and notified Skokie police. In 2007, Saxton was arrested after Chicago Police officers in the Jefferson Park district on the Northwest Side stopped his car because it matched the description of a vehicle associated with a police impersonator in the area, according to a police report.